A car drives slowly down Old NC 98 on Sunday in Wake Forest, North Carolina. A storm spreading snow, sleet and freezing rain across a wide swath of the South has millions of people in its path, raising the threat of immobilizing snowfalls, icy roads and possible power outages. CHARLOTTE, North Carolina — A massive storm brought snow, sleet, and freezing rain across a wide swath of the South on Sunday, causing dangerously icy roads, immobilizing snowfalls and power losses to hundreds of thousands of people. “Virginians should take all necessary precautions to ensure they are prepared for winter weather storm impacts,” Virginia Gov. Ralph Northam said. 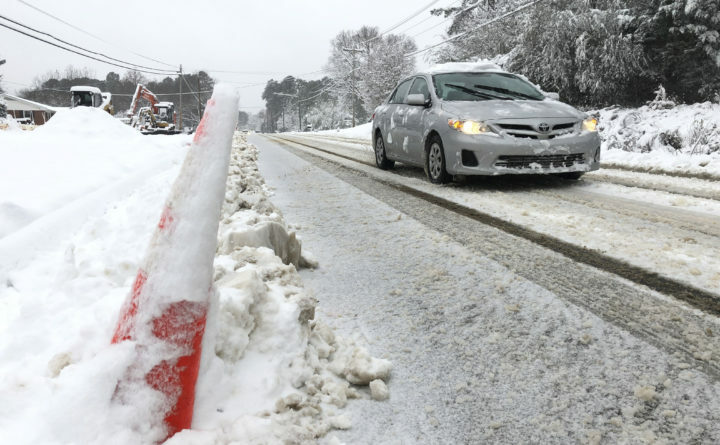 The National Weather Service said a “prolonged period of snow” began late Saturday and would last until Monday in the region, with the heaviest snow expected in northwest North Carolina and southern Virginia. Forecasters have said some mountain areas of North Carolina could get up to 12 inches of snow or more. More than 300,000 power outages have been reported across the region, with the majority of those — about 180,000 — in North Carolina, according to poweroutage.us. More than 82,000 were without power in South Carolina, while a total of about 75,000 outages were reported across Tennessee, Alabama and Mississippi. Charlotte Douglas International Airport, the sixth busiest airport in the country, said American Airlines would reduce its operations starting Saturday evening, with more than 1,000 flights canceled on Sunday. American has also issued a travel alert for nine airports throughout the Carolinas, Tennessee and Virginia, meaning passengers may be able to change travel plans without a fee. Signs of a pending monster snowfall were prevalent. Traffic crews treated roads ahead of the storm. Amtrak has canceled or modified some routes because of the storm. And many hardware stores sold out of ice melt.